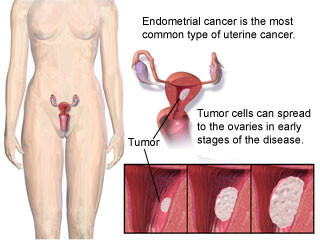 Endometrial Carcinoma (also termed as Uterine Cancer) is defined as a kind of malignant (cancerous) tumor on the uterus or endometrial lining. Endometrial cancer, in fact, is one of the most common type of gynecologic carcinomas being suffered from in the United States. The disease affects almost 38,000 women yearly. That comprises of approximately 6% of all female malignant cancers. Endometrial Carcinoma ranks number 3 among the most common cause of cervical and ovarian cancer deaths. During the occurence of Endometrial Hyperplasia accompanied with excessive vaginal bleeding, Endometrial Carcinoma will be present more often than not. The early stages of an Endometrial Carcinoma normally begins in the cellular layer that comprise the endometrial glands. This is a single layer of cells that entirely covers the endometrium over. Some other manifestations will be present aside from what was mentioned above. Anemia (caused by blood loss), pain in the legs and back, lower abdomen and pelvic cramping will all be experienced by the sufferer. Additionally, a clear or whitish vaginal discharge may also be evident among post-menopausal individuals. There will also be body weakness and general weight loss - signifying that the disease is spreading. Endometrial Carcinoma has several classifications. The one that peri- or pre-menopausal women suffer from is called Type I Endometrial Carcinoma. The good thing about it is having a relatively good prognosis. The cancer’s degree of invasion is not too high and only affects part of the uterine wall. On the other hand, the one suffered by post-menopausal women is the Type II Endometrial Carcinoma. Unlike the previous type, this has a poorer prognosis. This is because any one of three diseases can occur, namely Uterine Papillary Serous Carcinoma, High-Grade Endometroed Cancer and Uterine Clear Cell Carcinoma. This type, fortunately, is limited only to African-American women. This cancer has many more subtypes. The most widespread among them is the Endometroid Adenocarcinoma. This disease is most common among menopausal women who have been had a history of excessive estrogen exposure. As far as scientists are concerned, Endometrial Carcinoma begins to develop once the mutation of genes in the cells gets underway. This is why genetics is a huge contributory factor in making the disease possible. This is because of two cancer causing genes, the oncogenes and the tumor suppressor genes. The former is the one to blame for causing cell division while the latter is for preventing cell division. These genes are typically found in all disease-free human cells. But what causes them to undergo genetic mutation are in-born defects in the genes. Carcinogenic substance exposure can be the reason for the occurrence of acquired mutation. Carcinogenesis, based on the aforementioned facts, results from accumulated gene mutations combined with being constantly exposed to carcinogenic substances. Aside from the ones mentioned above, there have also been other alleged causes of Endometrial Carcinoma. A lot reportedly depends on the patients’ hormones, tissue type, and carcinogen exposure sensitivity. Substances such as alkalyting agents, asbestos, tobacco, and vinyl chloride all lead to carcinogenesis as well as inflicting DNA damage. Additionally, diet also plays a major role in the development of Endometrial Carcinoma. Eating a diet rich in animal fat, nitrate, and other food additives and preservatives should be taken note of. 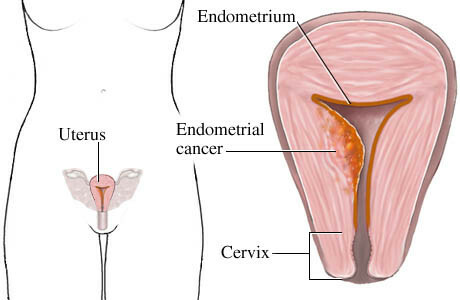 Endometrial Carcinoma is a lot tougher to diagnose than the more common cervical cancer. This is mainly due to the uterus’ location - which is above the cervix. A Pap Smear is usually performed to diagnose the condition. But it may become inaccurate since the inner cervix is the only portion that a smear sample can be obtained. That means the part above the cervix is not being included. Therefore, the use of a special instrument during biopsy is necessary. A pelvic sonogram can also be used to diagnose Endometrial Carcinoma. This instrument is responsible for measuring the thickness or extent of the carcinoma. If the measurement of the lining is 4 mm or less, having to undergo biopsy will not be anymore necessary. Good thing there is a new development in testing called TruTest. It makes use of a Tao Brush that bendable enough to do a uterus lining sweep thoroughly. Unlike the Pipelle Biopsy, TruTest has the ability to secure an appropriate amount of tissue needed for biopsy in seemingly less invasive manner. A comprehensive physical exam and medical history assessment will be performed by the physician. Additional tests like a complete pelvic and rectal examination, blood chemistry, liver function tests, stoll guiac test, and chest X-ray will also be done accordingly. A colonoscopy will also be indicated once the stool guaiac test comes out with a positive result. Can It Still Be Treated? In the disease’ initial stages, Endometrial Carcinoma is said to be highly curable. Surgery is usually the first treatment the patient undergoes. This is particularly done if the tumor possess high risk characteristics. It is also applicable when almost half of the cervix extension, the myometrium, has been affected. Omentum removal be done, too. Abdominal hysterectomy, the medical term for surgically taking out the uterus, may be performed on a case to case basis. The reason for this is in order to check for metastasis to other nearby tissues and organs. Radiation therapy is usually done for Stage 1 and 2 patients to reduce the risk for cancer recurrence. This is typically performed after surgery. Chemotherapy is the go-to mode of treatment for Stage 3 and 4 patients. As long as it is diagnosed early, Endometrial Carcinoma possesses a better prognosis versus both cancers of the cervix and ovary. When radiation therapy is performed post-opratively, the probability of recovery is a stunning 90% as long as no other abdominal tissues have been affected by the cancer. A massive 98% curative is possible with both early diagnosis and immediate treatment of the cancer.